Bot background. Rainfall favors Botryosphaeria (Bot) and Phomopsis canker and blight of walnut when temperatures are over 50° F, so be alert to disease spread this spring and summer. Bot reduces yields by killing small fruit wood and large branches and directly infecting the nut. It is most obviously seen in walnut orchards as blighted shoots (dead branches with the leaves still stuck on), blighted twigs (dead, darkened and shriveled, Photo 1) and fruit with the entire hull blackened but still on the tree. Fruit can also have early season latent infections, but tissue death won’t be visible until late summer/early fall. The focus of this article is on 2016 Bot research findings. Spore types. Both pathogens (Botryosphaeria & Phomopsis) produce abundant water-splashed pycnidiospores and wind-borne ascospores. Practically-speaking, this means Bot can spread by spores dripping and splashing OR by blowing around in the orchard. Both spore types need water to trigger infection. Conditions needed for disease. Bot infection requires susceptible tissue, presence of infective Bot spores, and the right environmental conditions – at least ¼” of rain (or irrigation water directly on susceptible tissue) and temperatures at or above 50°F. Management integrates cultural (pruning) and chemical control practices. Cultural control – reduce inoculum by pruning out dead branches, branch stubs, and blighted shoots in the summer or fall when not raining; disinfect pruning equipment; avoid sprinkler irrigation that wets the canopy. Chemical control – apply effective fungicides at proper timing adjusted for weather and Bot inoculum level in orchard. There are several fungicides that have reduced blighted spurs compared to the control in studies and their efficacy is ranked here in the walnut section. Timing sprays based on rain and temperature delivered the best control. This may be the most important finding if we continue the have a wet spring: In the Leaf Wetness Model (LWM), sprays were only applied when there were environmental conditions conducive to disease (≥¼” rain and temperatures ≥50o F). This resulted in three sprays in both 2015 and 2016. A fungicide is applied within 2-3 days of a rain event and estimate a 2 week residual. 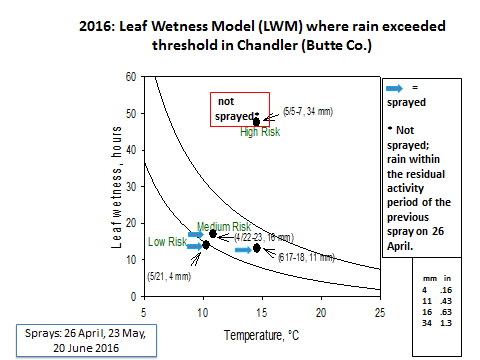 Use the LWM graph in Figure 1 during a rain event to pinpoint the BOT risk zone and determine whether a spray is needed. Figure 1 (Click on photo to enlarge). 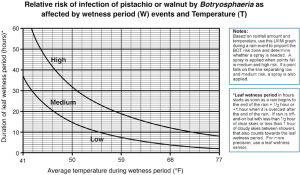 Based on rainfall amount and temperature, use this LWM graph during a rain event to pinpoint the BOT risk zone and determine whether a spray is needed. A spray is applied when points fall in medium and high risk. If a point falls on the line separating low and medium risk, a spray is also applied (see Figure 2). Figure 2 shows how rain events triggered three sprays in 2016. The only reason the high rainfall, high risk event on May 5-7 was not sprayed is because it was within the 2-week fungicide residual period of an earlier spray. Note that if a point falls on the line separating low and medium risk, i.e. during the rain event on May 21, a spray is also applied. Figure 2. In 2016, the LWM triggered four risk events but only three sprays were needed. The high risk event fell in the period when there was residual fungicide activity. The three spray dates triggered by the LWM in 2015 were April 9, April 26 and Sept 17. The LWM was more economical than the 4 calendar sprays that gave equal control: April (bloom)+May+June+July or May+June+July+November (post-harvest). If only applying one fungicide spray, the second part of June to first part of July had the most effect, when tested in both a low (8% infection when unsprayed, 2015) and high (38% infection when unsprayed, 2016) disease year in the same orchard. When sprayed just once at either bloom, mid-May, mid-June, mid-July, mid-August or post-harvest (October or early November), both the mid-June and mid-July sprays significantly decreased blighted shoots when compared with no spray treatment. Bot inoculum and brush disposal/spray scenarios: Chipping pruned wood reduces ability to cause infection by only two-thirds, so brush removal is still best option in light to moderate infected orchards. Always prune or hedge your more lightly infected orchards before moving to heavily infected ones. Watch for rains and spray according to leaf wetness model if possible. Heavily infected orchards (>50%): Chip prunings and may leave in orchard since already high inoculum. Use a full spray fungicide program. (From experience, when inoculum on the trees is very high, there is a saturation point beyond which additional spore loads reaching the canopy do not cause more infection). 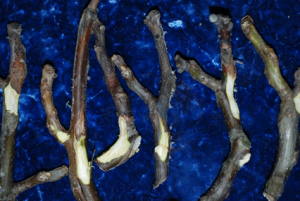 Moderate (20-50%) infected orchards: Do not chip prunings but remove from the orchard and burn them if permitted. Some fungicide spraying. Light (1-20%) infected orchards: Do not chip prunings but remove from the orchard and burn them if permitted. Use one mid-June or early to mid-July spray. No Bot infection (mostly only applies to young orchards): Chip prunings and leave in orchard. No sprays are needed.